Diocesan Food Services has a FaceBook Page! ​Meet our beautiful cafeteria ladies!! Karen Morris is the cafeteria manager, and Marti Rhinerson is her assistant. These ladies go above and beyond the call of duty everyday to give all of us meals full of love in our home away from home! Come and enjoy lunch with your student! As you know, Mary Carrico Catholic School began this school year with a brand new cafeteria! Read the article from Messenger-Inquirer that tells all about how this came to be! My School Bucks - put money into your child's lunch account online! If you are new to the site, sign up, choosing Diocese of Owensboro as the school system. 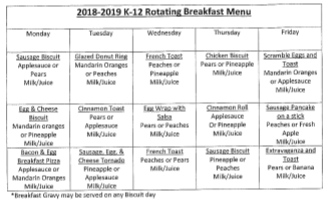 Here are the rotating breakfast and lunch menus for our cafeteria. Occasionally there will be a change, but it will be announced. Each rotation was begun with August 13-17 being week one. 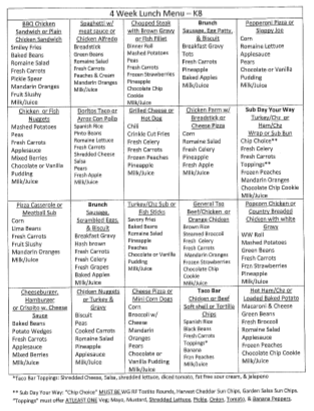 Count from there to see which week we are on, and what you can expect to eat!